Now don’t take the word “warning” the wrong way. Not all cuts by the Scythe are a sign of danger. It’s quite possible the querent is the one doing the cutting, and he/she could be removing something negative from his/her life. Warning really just means pay attention because either a cut (negative) or a harvest (positive) is going to occur. Career: You could be leaving your job soon, either by choice or through termination. You might also completely change your career, switching to something quite different from what you’re doing now. Health: Surgery may occur – look at other cards for more information. Love: A relationship may be coming to an end. Timing: The Scythe is connected to the number 10. It can mean Autumn, October, 10 days, 10 weeks, or 10 months. If the Mountain is present, it can mean 10 years. 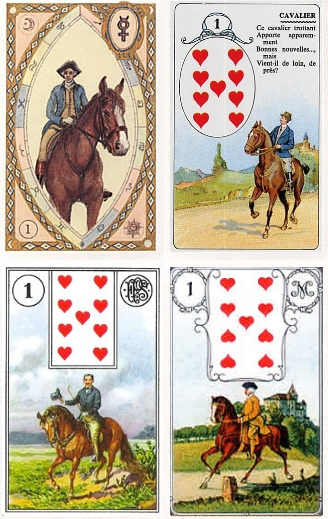 Cartomancy: The Lenormand Scythe represents the Jack of Diamonds. It can mean a messenger, someone who brings news, and a young man (usually with light colored hair). More good questions! Thank you Claire! There have been fascinating discussion about the differences between the Snake and Fox. In my view, both cards could indicate deceit and lies, but it’s the motivation behind the two that are different. In the Snake’s situation, the person is actively trying to manipulate a situation to suit their goals. Meanwhile, the Fox on the other hand will only trust people that are within it’s circle of trusted friends and advisors, and will likely adopt a policy that outsiders are not to be trusted with the information. In this case, the Fox is more likely lying to you because they don’t consider you worthy of being given the full truth, but they might give someone else the full unfiltered truth. With respect to the Anchor when it comes to work questions: I have found that the anchor is typically seasonal work. For example, for a certain period of time, with a firm end date in mind. So, if anyone is looking for work during the summer, they might be in luck!! Perhaps not so much if they were hoping for a full career with the employer however.